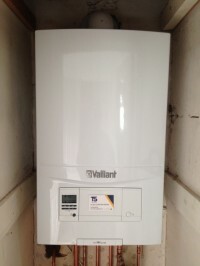 T S Gas & Electric Ltd. are Gas Safe registered heating engineers who supply and install gas boilers. For similar replacement boiler companies in this area please visit the Wolverhampton boiler page. TS GAS & ELECTRIC LTD. Thank you for your comments. We will contact you when the annual service on the boiler is due. 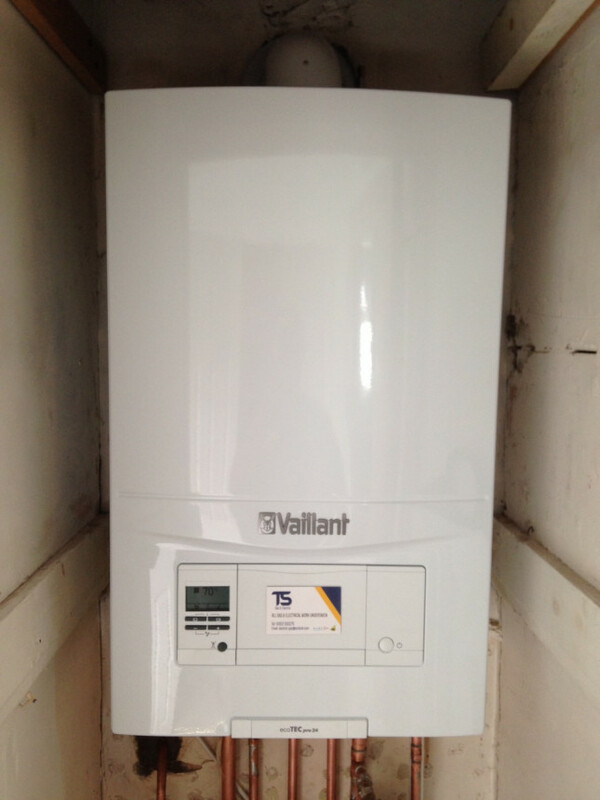 The salesman was also a boiler installer and knew his products. This was very helpful in deciding on a model. The installation was very swift after we committed - the installer was tidy, friendly and completely competent, and at the end of installation day we had a mess-free kitchen with a brand new boiler. The price was very competitive. Very happy customers. Work completed in a professional and courteous manner. Impressed our fast and how clean the guys worked with the installation of the boiler. Would recommend this company for delivering a job well done. Thanks. I can’t recommend this company enough. Efficient, reliable and extremely competent. They understood our requirement and delivered exactly what was required. First class service. Thank you. Brilliant service, everything explained in a way I could understand. Genuine, Honest, Reliable, No Pushy Salesmen! We had several quotes. T&S were by far the most genuine and informative. Their Sales Rep Indy was straight-forward, honest and helpful - even when I directed questions arising from other quotes. No pushy hard sell at play - he just wanted us to choose a boiler and company that suited our needs. And he answered many questions over several days - I didn't want to rush an expensive decision. Other companies were literally pushing for us to sign up with them! The engineers that Indy sent (Vic & Vic) were amazing, knowledgeable and very clean and tidy in their work. They worked tirelessly through the job so we could have everything sorted in one day, even sorting out some old pipes that needed re-positioning. I was concerned they were not a company local to me, That they would send a sub-standard fitter... I needn't have worried. Ticked all the right boxes. I chose T&S for all the reasons above and would highly recommend their services. The inspection for the quote was done professionally and without attempting to influence my decision. Once I accepted the quote the installation was done within the week and also carried out professionally with minimum disruption. The area concerned was left clean and tidy and I was given clear instructions on using the new boiler. I highly rate TS Gas & Electric Ltd and would recommend them to anyone seeking a boiler change. Great job by the friendly team! Indy was very friendly, took time to understand our requirements and offered a competitive quote. Gavin worked really hard to install our boiler in good time and was very considerate towards our baby. New boiler is great and does exactly what we wanted! Very quick to arrange a visit to submit a quote which was acceptable. The new boiler was fitted 3 days later. The 2 man team were quick, efficient and their work was very clean and tidy. Would recommend them and I would happily use them again. Quick & efficient, two guys old boiler out and new one installed in 6 hours. Very satisfied. Boiler leaked straight after fitting. They could not return to deal with it for several days. Brickwork on the outside when changing the condensation pipe was dreadful. The cement used was totally the wrong colour and it looks an eyesore..total of 9 bricks used. Was told to purchase to match house but was not reimbursed for these.. Attitude of the owner when approached with these issues was extremely unhelpful and was not interested in doing anything about it. TS Gas was found on checkatrade so assumed they would be good. I would not recommend them to anyone as the workmanship was not up to standard and also I have doubts as to the standards of checkatrade. We dealt with a minor issue in that the plastic condensate pipe on the boiler had a very slight drip on it. This was rectified after the homeowner advised she had placed a container under it and it was only a slight drip. This was fully resolved to the customer’s satisfaction, in a timely fashion. The customer placed this bad review after asking us to remove the cement we used to cement the brickwork and to put “dye” in it (to make it match other cement on the property). We explained that the other cement on the property had taken on a red shade due to half a century of weathering on the old red brickwork. It is impossible to match the colour of the cement to the old cement. The brick work was done perfectly. We also showed her other brick work on the house which had grey cement just like the one we had used. Cement and mortar is a grey substance. The customer insisted we put “dye” in the cement. This was an unreasonable and unworkable request which we were not able to carry out. The customer then placed this bad review, on what was a perfectly installed, fully functional and professional job. This was a job that was very well done and to our usual high standards. Everything within our remit was professionally done. Very professional. They insisted that they came out to see what work was required, so there would be no nasty surprises either way - some plumbers quoted from photos, others didn't come out at all. They beat the lowest price I'd been quoted elsewhere and used Worcester Bosch parts throughout - some others quoted for unbranded, cheap stuff. Plumbers arrived on time. The work was done efficiently and tidily - arrived around 1030am, the boiler was up and running by 4pm. I have no hesitation in recommending this company. Excellent and efficient job done in time stated. Work was of an exceptional standard, would recommend them to any potential new clients. Appointment for quote on time, all questions answered fully and process clearly explained. Competitive quote and no pressure to sign there and then. Engineers completed the job in a timely fashion, cleaned up after themselves and explained how to use the boiler. No issues at all and would recommend for others. TS Gas & Electrical were fantastic from start to finish. Out of the 3 suppliers they were the only ones to make an appointment to quote, kept the appointment, arrived on time, were courteous, polite and explained the programme of work thoroughly and they got the job because of this. They followed up their visit with an email that was polite but not pushy. On installation day their engineers called to say they were stuck in traffic and would be 30 minutes late. On arrival they got on with the job and worked in a very tidy and conscientious fashion. I'm very pleased with the boiler and the installation was seamless. Excellent service and would definitely recommend. The boiler was fitted as requested and the whole process was really efficient from start to finish. The two fitters were really friendly and cleaned up afterwards. The price was £1000 cheaper than British Gas and came with a 10 year guarantee. Old boiler taken away away. Thank you for a really professional excellent job would highly recommend this company. Thank you for your feedback. On a rare occasion jobs can take longer than originally anticipated. Gavin is a very experienced engineer and he completed the installation as efficiently as possible. 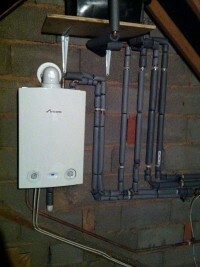 The end product was a very well installed and fully functional boiler. Our apologies if the time taken to do the job didn’t meet your expectations. We will contact you when the annual service on the boiler is due. 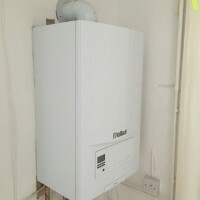 Getting a new boiler installed and moved from previous location is a bit of a daunting challenge in the sense that its a fair bit of money your parting with are you going to get value for money and the right company in to do it. Had 3 other boiler quotes and went for T S Gas & Electric very glad i did. Indy the surveyor came out and went over everything with us clearly and left us to decide without keep phoning us which other boiler company did. Date was finalised for boiler fitting and the team came out on time very nice guys no fuss or mess got stuck in and 2 days later fitted, had it installed couple of days and already noticed a difference in heat output and cost. Efficient and polite and work completed quickly. Highly recommended. They were the only installer that gave a thorough survey and gave a fantastic price. The team from the assessor to the installer seemed knowledgeable and competent. My old boiler was removed and replaced with a new one in September with minimum fuss and disruption. I'm really happy with the advice and options given and they were the only company who pointed out that we had an immersion heater which meant we didn't have to suffer while the boiler was broken. Three other tradesman came round and gave poor advice. Professional, courteous and the work was completed quickly. I'd highly recommend. 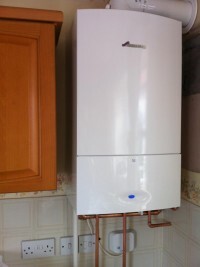 Professional yet friendly,the boiler installation was done with minimal disruption. Excellent service from the quote through to installation. Good price and very friendly and easy to deal with. Would highly recommend. A very professional, curtious and tidy team of workers. Would highly recommend to others looking for boiler replacement. The work was completed in a single day despite motorway travel problems delaying the start. The work was done to an excellent standard despite problems due to my 4 dogs The engineer was a very polite and concirnsious young man, I have no fear in recommending this company to anyone and I will respond to any questions asked by any potential customer. T S have my permission to pass on my landline phone number to future customers if required. The company was efficient in all aspects of its work from quote through to final testing of the product. Indy, the engineer, displayed a command of the operation and installation of the product which is somewhat scarce these days. Very polite, professional and reliable. Neat installation with no hassle, would recommend to other. and there was no mess. I would recommend this firm without any hesitation. Very good job and trustworthy l would recommend them to my friends. Excellent service and attention from the thorough survey visit to the installation which was carried out speedily and cleanly. Competitive price. All complete within time scale promised. Controls and gadgets clearly explained. Now up and running. Thanks T S Gas and Electric. Phil. I was very impressed with the professionalism and service provided by T S Gas and Electric Ltd. They went out of their way to give me a quote on short notice, and when I had some further questions, they offered to come to the house a second time (thanks Indy). They were extremely informative and wrote everything down so that I could refer back to it at my leisure. The guys that came to relocate and fit the boiler kept me updated and tidied up when finished. They explained how to work everything in language that I could understand. I would highly recommend them to all my friends and family. Arrived on time , all work completed ,very good and clean job,very cheerful ,friendly workers. 100% satisfied with the work carried out.We are very happy with the results. Highly recommend TS GAS & ELECTRIC and their work. The person who quoted for the work was a professional engineer with practical experience of heating installation. He listened to and made notes of all the work we needed to have carried out. We selected them as their quote was in line with our own calculations and they could carry out the job in a tight timeframe which lined up with the other work being carried out on our house. The work was completed to a high standard in 2 days. There was one area that we were not satisfied with - the pipework following the hot water tank removal. I explained what I wanted and they returned and sorted it a day later without question. Overall their service was very professional and I would recommend them to friends. They were very polite and professional. They explained what they had done and how to use the boiler. They cleaned and tidied up after themselves and you would not have known they were in the house! Initial contact and support was excellent, very professional with quote and outline of the detail. However on completion of fitting the new boiler and after the team left, Several issues were noted when the installation was running. Initially aeration in both the primary and secondary systems which resulted in bleeding the system every 24 hours. Cool radiators on ground floor, Contact was made with the company and also contact was made with the AA whom are my service providers. A visit was arranged for the AA engineer who was critical of several issues They also completed a check on the Worcester Bosch filter system which was part of the installation, the filter had to be cleaned as it was partially full of debris which after 3 weeks was considered poor. again this detail was passed back to the company. They the company did ring back and state both problem's were down to the radiators being contaminated with contaminates from the old system which were oxidizing the water and causing the air in the system. However part of the installation was a system flush which should have cleaned out the debris. They the company maintain they did do a flush but not the full power flush. My defence was that the system was working well prior to the boiler being condemned and there were no issues with heat or aeration of the system. Hence currently at the moment in order to keep the system running i have to bleed both systems daily. Thank you for the feedback. But as stated in our call to you we have only fitted the new boiler and one new radiator to your existing system. We have not in anyway altered your existing system. We can only be responsible for the parts of your system we have installed, not for existing old components. A system flush will remove a proportion of any debris but it will not make 20+ year old radiators brand new. The magnetic filter is doing exactly what it is intended to do, which is to trap any residual debris and protect the new boiler. The parts of your system we have installed have been done to our usual very high standards. helpful, confident, polite and courtrous. 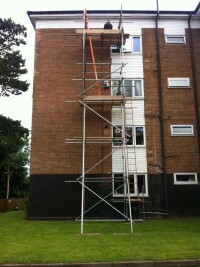 Fitters were very polite and completed the job professionally and in good time. The company was courteous and polite. I was kept informed every step of the process, from organising appointment times, explanations of paperwork and the fitting proceedure. The fitters were tidy, thorough and expedient. The company checked that I was happy with the product and explained how to program the controls of the boiler should I need to make heating adjustments. I recommend this company to future customers with confidence. Really good service , good price , would definitely recommend this company for anybody who wants a top job doing . Very good service from initial quotation with very competitive price, all the way through to the new boiler being installed. Although the installers arrived a little late due to traffic, they still called ahead to advise when they would arrive. Upon arrival, they explained the installation process and kept mess to a minimum, and making sure all old equipment was taken away. Excellent service from beginning to end. Speedy survey and quote and boiler replaced and fitted by extremely pleasant, friendly engineers who are a credit to the Company. Good service, engineers were helpful and professional but the installation could have been completed in 2 days rather than 2 and a half. It would have been helpful if they had cleaned up after themselves and removed all packaging. Brilliant service from start to finish - very clear information alongside quote and engineers were fab, really considerate of the fact I had a young toddler in the house. Overall really professional and I can see why previous reviews have also rated them so highly. Doing a site visit to doing the install T&S were a professional outfit with little hassle. Indy suggested a better spec boiler than the other companies out there and really took the time to advise us on what we needed. For a fair price and good workmanship I would DEFINATLEY recommend this company to friends and family! Thank you for your comments. We will contact you when the annual service on the boiler due. Time was at a premium and they delivered. Indy did a thorough assessment within 24 hours of my initial contact and the boiler was installed within 3 working days. The boiler installation team were all personable and tidy. 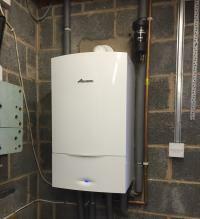 I am delighted with the new Worcester Bosch boiler and the long guarantee period. Tim in the office was an excellent communicator and swift in responding to every email and message throughout the process. A painless process. Job was done efficiently but the only complaints I have are that all of the rubbish was left out side the house, the overflow for the Boiler was not finished and the old thermostat was left in place. The rubbish and thermostat has been sorted but the overflow needs to be sealed in with mortar. Fantastic would recommend them . Very Happy with our new gas boiler and speed of the installation. Great customer services from T S Gas & Electric Ltd.
Great service from these guys. Came to quote after our work hours, pleasant and not at all pushy, extremely informative and gave us detailed costings every step of the way writing everything down for us to refer back to at our leisure later. Came to fit on time, hardly any mess in fact they laid plastic sheeting down and on the stairway. Explained the workings before leaving. Certainly recommend these guys A star service. Quick response, very accommodating with times and a polite and professional manner. Clear quote, not pressurised and fair price. Quick fitting, very tidy and again very helpful with times. Very professional in all aspects would highly recommend.